"The velocity of history will either break your back or give you wings"
The '80s is dead, y'all, and crack cocaine murdered it. Crack both disfigured the Belle Epoque of the 1980s and wind-sheared the wings on the American Dream, sabotaging it’s flight path and fracturing it almost beyond recognition. Crack created a mass grave filled with the time-eaten corpora of our communal selective memory; a grave twenty-five years deep and a quarter-century long. For some, the 1980s were the dawn of an America the RRC (Republican Ruling Class) thought they had lost in the 60s with the election of Kennedy--John F. and almost Robert F.--the proliferation of Dr. Martin Luther King’s multi-colored Dream, and the specter of Malcolm X’s Black Nationalist resolve stamped, By Any Means Necessary. By the time Jimmy Carter--the son of a peanut farmer who became a Naval officer--was elected President of the United States in 1976, the American Dream was beginning to have the potential retrofit of a land filled liberty and justice for all. The Carter Era--not Jigga or Weezy’s but Jimmy C.’s--was a prodigious time for us Mountaintop Children. The Mountaintop Children (or Black Boomers, if you will) are that progeny--primarily African-American--born at the rise of the Civil Rights movement; children of cultural privilege and promise, hoisted onto the shoulders of history by ancestors who struggled, bled, and died to make this One-Nation-Under-GOD -With-Liberty-And-Justice-For-All-America, a level playing field. Even in the "imaginarium" of television, Black people had visions of a better life. Florida Evans and her familia of J.J., Michael, and a married Thelma were no longer scratchin' and survivin', and finally moved out of the Cabrini-Green Houses in Chicago. George and Louise Jefferson were the proprietors of a chain of successful dry cleaners, that allowed them to move on up and live among the wealthy on the Upper East Side of New York City. But the good times were cut short by the Iran Hostage Crisis in 1979, which ushered in a former actor, laundry detergent shill, and poster boy for the Republican Ruling Class, by the name of Ronald Wilson Reagan. The Reagan Ideal was a get-one-for-The-Gipper return to an America the RRC was more comfortable with; white, Republican, racist, repressively transgressive, remunerated, and removed. Removed from the plight of the poor (Black and White folks, too), the blight of minorities, and the financial apoplexy of the middle class. The Reaganites were a coterie who took their White Parties on Sutton Place and in Santa Barbara, literally and seriously. This was an America the Reaganites saw as the dawning of a new day for old prejudices wrapped in a new ideology. President Reagan called it, "Morning in America." However, for many others, that "Morning" became their own personal Mourning in America, and crack was the assassin. Crack was the explosion that shook fear into the Black Boomers and began to turn the purpose of the Mountaintop Children into an avalanche of nightmarish apathy. In the African-American community, crack was a dream-killer, a bank (and drug proceeds) builder, a cradle-robber, and prison-stocker, and a tomb-filler. Crack was a circuit breaker in the psychic fuse box of African American advancement. Crack rewired the motherboard of the descendants of the Motherland, reprogramming them into the 20th century slaves of a new pharm-land, where the cash crops of cooked cocaine had been reaped from the infertility of their very own hopes and dreams. Crack cocaine vaporized the ‘80s into a stagnant era odorized with the acrid, postmortem stank of aborted and unfulfilled wishes. Crack created a generation that swooned in the ferocious vertigo of convoluted American game theory; game theory played out on invisible Ouija boards located at 1600 Pennsylvania Avenue in Washington, DC, with pieces marked “Oliver North,” “Contra,” “Guns,” and “Cocaine.” A rigged contest with politically loaded dice, prejudicially marked cards, and scores tallied (and settled) by the finality of zero-sum conclusions. The splintering of the RRC’s erstwhile pursuit of happiness in this New Republic, was divvied up in a variety of ways; to whom and how that pursuit of happiness was dispensed depended on what portion of the social prism you belonged to. The darker the pigmentation in that social prism, ofttimes, the more oblique the despair during the 1980s. Read the entire "Mourning In America" introductory essay, in my new anthology, "Hooked On The American Dream-Vol.1: New Jack City Eats Its Young," available exclusively on Kindle/Amazon. Amazon/Kindle has a free, downloadable app for all computers and mobile devices. 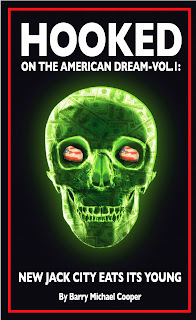 Click here to go to the "Hooked On The American Dream-Vol.1:New Jack City Eats Its Young" Kindle store site.